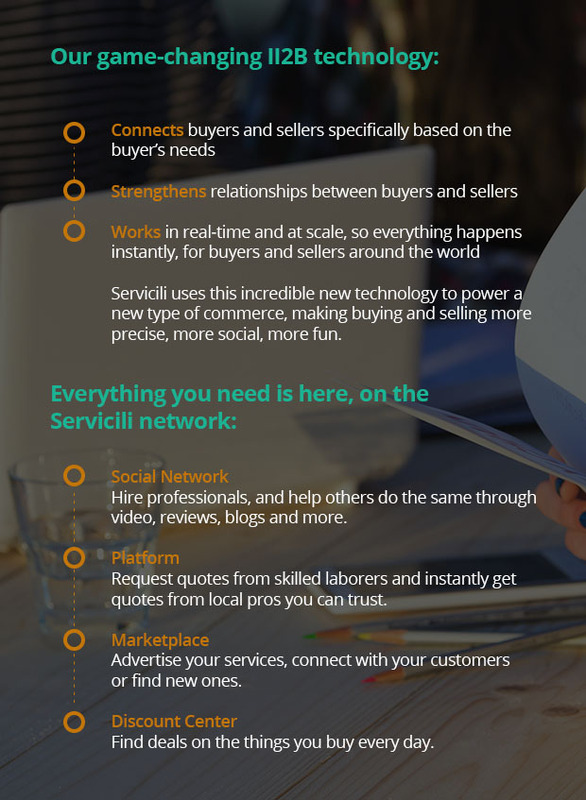 Servicili is the ultimate commerce platform for the Connected Age: you can hire local service professionals, browse the online classifieds, and take advantage of great deals from local businesses — all while using our built-in blog network, photos, video, and sharing capabilities to connect with other Servicili users. Servicili is a one-stop-shop to get whatever they need and have fun doing it. It’s a way to connect and engage with current and future customers on a whole new level. The Servicili vision starts in South America, with empowering local buyers, sellers and businesses. It ends with a global paradigm shift in digital commerce, and connecting the next billion internet users to each other like never before. 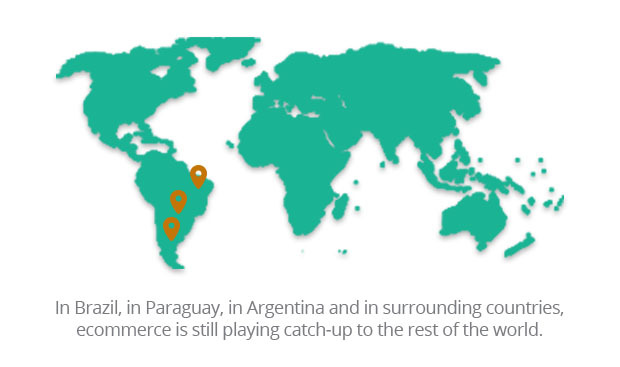 In South America, there is no centralized place to find the things you need online. Ultimately, the simple task of buying or selling something online leads to more questions than answers. Say you need an electrician. There are tons of them out there, but finding one is incredibly frustrating. Or, let’s say your car is in desperate need of maintenance, so you’re in the market for a new or used replacement. Where do you find it? And when you do, how do you know the seller can be trusted? You could turn to Yelp, where a quick search for electricians in Rio de Janeiro yield just a single review for their top ten results. A Google search isn’t very helpful, either. This isn’t rocket science. It shouldn’t be, anyway. It should be easy to find local items for sale, or to sell them yourself. Quotes from local professionals should come to you, not the other way around. And when you hire someone, you should know that they’re trustworthy. That’s where Servicili comes in. We’ve built a platform that eliminates the guesswork and connects you directly to what you need. Servicili is local buying and selling with a social twist, made possible by a powerful new search technology. 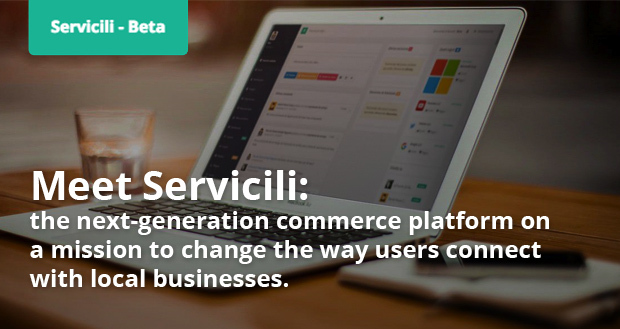 Servicili is about commerce, but it’s so much more than that. You’ll find classifieds and service listings interweaved with a social network that serves up first-class entertainment: blogs, videos and photos. It’s not just a place to buy and sell. It’s a place to reach out, to find a deal, to get informed, or just to say hi. It’s the one platform you’ll never want to leave. 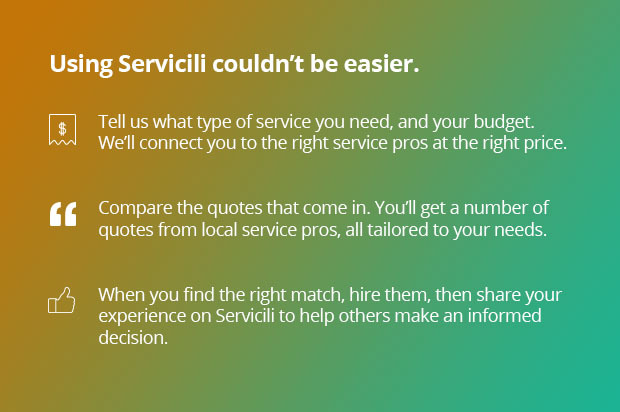 If you need something, Servicili will help you find it. If you just want to be entertained or connect to great people, we can help with that, too. Servicili’s secret sauce is a powerful new search technology called II2B. The II2B platform makes it possible to connect consumers with suppliers instantly, forging new relationships between businesses and their customers. Commerce has never been this easy, or this fun. We’re hard at work fixing bugs, adding features and polishing everything up. Now it’s time to take Servicili live for the one billion consumers coming online from all over the world. 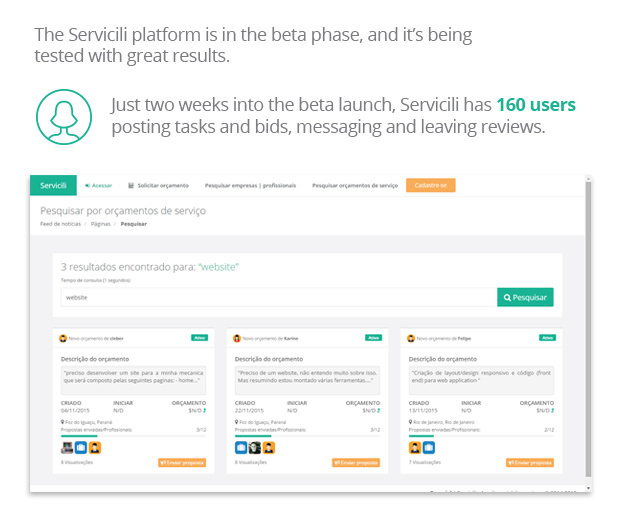 Ready to hear more about Servicili’s plans? Click the “business profile” tab at the top of this page to find out what’s in store! Daniel has worked as a software architect for the past five years, leading a government project team to a revenue increase of more than 250 percent. He specializes in user experience, SEO and marketing. Antônio is a web designer and programmer, and Daniel’s former colleague. Carlos has served many companies as a growth hacker, inbound marketer, web designer and even a filmmaker. He’s adept at SEO and marketing analytics. Formerly of Enlink, Priscilla has worked with Bitdefender, Skyscanner, Bottero and many others as a link-builder, SEO specialist and writer. Anderson is a food service industry veteran, having represented many large companies as a seller in Brazil. He’s sold utensils as a Manager of Sales health plans in Foz do Iguaçu, demonstrating his versatility. Responsible for new customer acquisition, Anderson is responsible for every aspect of the client relationship, from start to finish. Previous articleThe Grid: A sustainable and modular backpack of premium canvas & leather that you can customize to your needs!